– Devotee’s Photo Identification such as Aadhar Card No., Voter Card No., Pan Card No., Ration Card No., Passport No. or Driving License No. 3. Then Click on the Register Link on the website. It will ask Whether you have a Devotee No. or not. Simply Click “No” if you are a first time Devotee and booking it. 4. A Form mentioning all fields mandatory will appear. Just fill in the required information as suggested above in the form. 5. Proceed once you have filled in the form and it will Re-confirm the Devotee’s details. Just go thru each detail carefully and then enter Captcha code and click “Register & Proceed”. 6. Window with message appear that you have been successfully Registered. Alongwith this, an OTP has been sent by the authorities for enhanced security and verifying that its indeed a Devotee’s request to be registered. Just enter that and click “Verify & Login”. 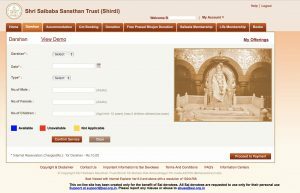 Once Devotee Login with his credentials, a window will appear like the one shown below that shows various tabs like Darshan, Accommodation, Cot Booking, Donation, Free Prasad Bhojan Donation, Saileela Membership & Books. Follow this link to enquire about Shirdi darshan for Government employees. 2. There are two types of Categories in Shirdi Darshan as you can clearly see, One is Darshan and second one is Arati. Both categories have different timings. – First Darshan timings starts from 6:45 Am and last one at 21:00 in the evening. There is break in the noon after the last Darshan session that starts at 9:45 AM. Darshan resumes again in the after noon at 13:00 PM. 4. Devotees can make online payment by Master, Visa & Maestro (Issued by the bank ) and Net Banking from HDFC bank. All online payments on Shirdi Sanasthan are secured shown while Devotees confirm their payments. 5. Internet Reservation charges of Rs 10 will be added once devotees proceed further with the online booking. – Select Any of the Arati timings according to your faith and check its availability. – Devotees can make online payment by Master, Visa & Maestro (Issued by the bank ) and Net Banking from HDFC bank. All online payments on Shirdi Sanasthan are secured shown while Devotees confirm their payments. – Internet Reservation charges of Rs 10 will be added once devotees proceed further with the online booking. Note – We will out line Darshan Timings and Shirdi Arati Darshan Timings and its significance in separate article for Devotee’s. If you have any query on Shirdi Darshan Registration, please leave your comment below, we will get back to you at the earliest. Evening Arati Booking is yet not open for booking. Please check on 21st September for availability and booking. Please guide us, as we are 2 adults and 1 child visiting Shirdi on 29th Sept evening. We really need your help, as the attempt to call customer care wasn’t of much help. The calls to PRO office ends up as Fax-connected-phone. There is counter available nearby Temple. you may attempt there directly. I want to darshan Saibaba at 5.00 p.m.on dated 30.09.17 with my family , In which 2 no.of male ,1no. Male child and 4 no. Female. So please book on time for that we can darshan Saibaba. Currently Shirdi Darshan booking online is not available for 30th September. However, you may procure the tickets directly at the CRO office. I am visiting Shirdi temple on 2nd nov with family.Want to book accommodation and Dhoop and kakad Aarti tickets online.Tell me about the availability of tickets for both accommodation and Aarti . Please ho sake to jaldi bataiyega sir. The Dhoop & Kakad Aarti tickets are available for the date 2nd Nov. You can book Now Kakad & Dhoop Aarti Tickets online from Shirdi Official Website. Also you can book accmmodation for date 2nd Nov from Shirdi Sai Trust website. At present AC, Non AC and all other types of rooms are available for 2nd Nov 2017. My husband and I, from Malaysia will be in Shirdi on 17th Dec 2017 . Please can you let us know if we can book the darshan while there . 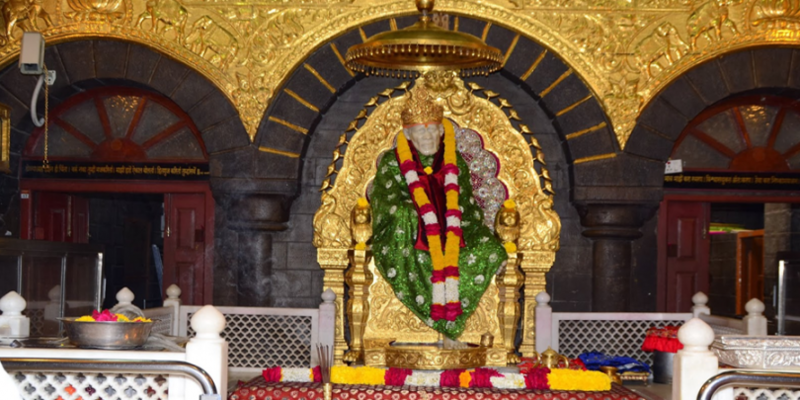 You can book Shirdi Darshan Tickets Online from Sai Trust Official Website. It is advisable to book Shirdi Darshan & Aarti or Pooja Tickets online from Sai Baba Official Website. At counter there were issuing tickets only to Senior Government Officials on production of id card. I am not sure .. if any changes off-late. 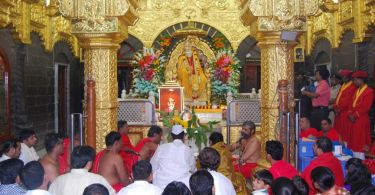 Sir you can book Aarti and Darshan tickets online from Shri Saibaba Sansthan Trust. Also there is no aarti tickets available for date 18th feb. Please select another date for aarti and darshan tickets. Please let me known if you need any more help. Very nice beutifull manegment Shirdi sansthan om sai ram ???? Morning Aarati(kakada ) is not opened for Dec 1st 2018…Please let us know when it will be open?